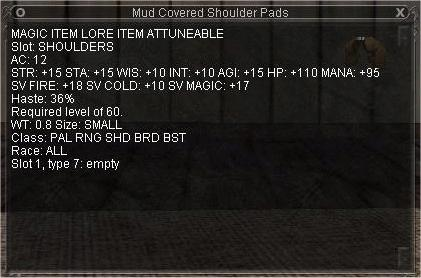 Item Lore: A pair of worn shoulder pads, slightly covered with mud. a random drop from 1.5 epic chests. On average how much would a set of these set me back? 36% haste 100 raw hp 12 ac great stats and saves how does 150k-200k sound depending on which server you are on. Look these up they are the best droppable shoulders for Rng, Bst and listed near the top for the other classes. "Nothing to see here move along"
Dropped pon for paly epic , in chest. Item dropped in Barindu from chest after doing Necro epic 1.5 fight. This can also be dropped from a chest after the ranger epic part in Bloodfields. I have this item and I don't think I saw haste on it. I will double check tonight. This is the one off of the CHEST from Captain Varns, an epic mob for sk i believe.